1. Cook the potatoes in boiling water for 10-15 minutes until tender, drain and cool. Meanwhile cook the broad beans according to pack instructions, drain and cool. Place the beans in a food processor and blend to a coarse paste. 2. Crush the potatoes and stir in the beans, 1 tbsp of the mint, the coriander, 1 tbsp of the yogurt and some seasoning. Shape into 4 cakes. 3. Heat the oil in a large frying pan and fry the cakes for 3 minutes on each side until golden. 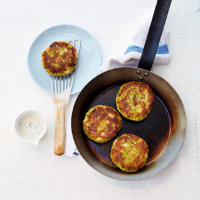 Mix the remaining yogurt and mint together and serve with the potato cakes.